Give them that "home away from home" feeling with this thick fleece bedding! 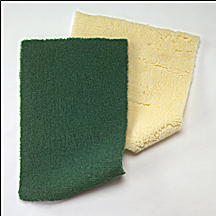 This fleece is ideal for animals recuperating from surgery or those needing extra padding. The fiber density whisks moisture away from skin and coat. Machine wash, dry, bleach and reuse. It cuts easily to any size and is flame retardant. Deluxe thickness 1 - 1 1/4"
* Due to size, an additional handling fee will apply.